A new month, a new Stitch Fix post. This fix was a big womp womp. Apparently none of my pins were available, which is understandable, but the styling seemed a bit off. Even worse, the fit was terrible. I have a long torso, and unfortunately my fix included a few short tops. I did ask for an accessory & dress, and my stylist delivered on those which I appreciated. They just simply were not quite right for me. I didn't keep anything, which is only the 2nd time this has happened. Regardless, I still took pics and am here to share my fix in case any of you want to pin these looks! Market & Spruce Mainy Pullover Sweater I wasn't wild about this when I pulled it from the box, but I LOVED it on. The only reason this wasn't a keep was because of how short it was on me. I felt like I would constantly be pulling it down. RD Style Kassidi Dress This dress was a near keep for me. It's short, but perfect with leggings (which is what I asked for). My favorite part was that it snaps instead of buttons. Far easier to deal with and very nursing friendly. It did have two strange slits at the sides that made it lay a bit weird. I have two dresses very similar to this, so I didn't keep it. Lemon Tart Manni Zipper Detail Pullover Sweater This sweater is super soft & cozy! However, I wasn't a fan of the side zippers, or the loose knit. This sweater requires a tank underneath to prevent it from being see through. Fun2Fun Welby Cold Shoulder Blouse Oh my this was just awful. It was short and had a strange detail on the bottom. While I love showing off my arms, this style was so not me. I'm a SAHM, so I'm not sure when my stylist thought I would wear this. Sure I love the occasional date night outfit, but if I'm heading out on the town, I'm going to be flaunting some leg & some cleavage...not my elbow...! 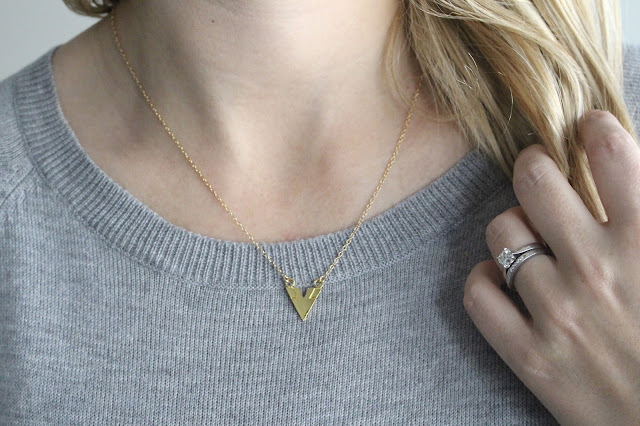 Gorjana Shae Reversible Arrow Necklace I would call this a triangle, NOT an arrow. I liked the simplicity, but the quality was really lacking for the price. What do you all think? Should I have kept something?! Even though this fix was a bust, I still love the service and the package that arrives in my mailbox every so often! If you have yet to jump on this train, at least give Stitch Fix a chance. And please use my link; my closet will thank you forever...or at least a season! I HATE when tops are too short so I totally feel you on that one. I think that's why I constantly wear a tank underneath, no matter the weather, to make it longer. I did like that one dress that you posted on snap chat though, would have been cute with leggings and boots, but if you already having things similar, i totally understand why you would send it back. Hopefully next time will be better! Oh yeah l, I'm not a fan of short tops either! I hate pulling things down or having my skin show when I raise my arms up! Too bad the necklace wasn't nicer so you could have applied the styling fee to that. But oh well... Hopefully better next time! The dress was super cute - but agreed, not if you have one!!! And you are adorable! Fun fix! My next one comes in about 2 weeks, and I can't wait. I love the first top. I bought a dress this summer for a wedding with open sleeves like that and HATED it the entire night - it was so annoying and kept getting twisted around, no thanks! I really liked the first sweater, but if it didn't fit right then it's not worth the price. Well I love that dress / tunic on you! I could see it being super cute in Fall and Winter with boots and a scarf (red!) or something. And I agree about the polka dot sweater -- super cute but def too short to keep. That last top seems totally off for you. I don't see if being something you'd wear at all. I haven't loved the jewelry they've sent me in the past -- not great quality. Love seeing your fixes! Ugh, bummer!! I just got my box last night, and although I haven't tried anything on, I am not too excited about anything. :/ sometimes, I want to keep everything, and sometimes I send it all back. It's still fun to try it all one!! And what is up with these side zip sweaters? I've bought (and returned) two that just make me look so much wider than I am! I always have the opposite problem - I have a really short torso and so tops always seem to be long on me. That knit sweater would be much better with out the zipper. I agree with you on not keeping these. Hopefully next month will be much better! ooh i love that polka dot top, but yeah too short is a deal breaker. that dress is cute as well, but the slits do make it lay weird. i wouldn't keep or pay for any of that if i didn't love it, that's what i am trying to avoid lol. you'll never wear it if you don't love it. I really like that sweater! You look so cute in everything, but I totally get the NEED to be comfortable in what you wear. Lifting and bending and picking up--being comfortable is a necessity. Bummer that you didn't find anything in this fix! I like that dress, but I see what you mean. I have a long torso too and just layer everything to be on the safe side; summer is not my favorite season because of my layer tendency lol. Too bad about that polka dot sweater, its darling! Yikes. This makes me nervous for my Fix coming next week! Although, I do like the zipper detail sweater. I probably would've kept that! Oy, I love every single thing you got! I want this box! Sorry to hear that so many pieces didn't work though. I love the striped sweater and the polka dots! And that black dress top looks amazing on you! But I totally get what you mean about them all. Ugh! So close! That sweater is soooo cute...minus those odd zippers. Zippers are too harsh for something so delicate. I'm with ya: cleavage or leg not elbows for a night out on the town!